Game of Thrones has never been, and never will be, a perfect entity. The show's sixth season has been underwhelming in a number of respects: sure, it soared along like wildfire in its opening half, but the second half has, thus far, meandered wildly away from what the show should be focusing on at this stage in its run. 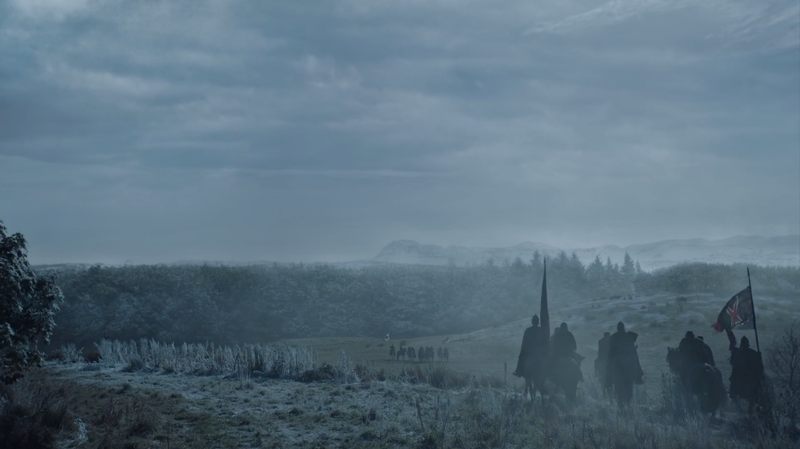 It's been a solid season of the show - probably about on par with the previous season but far from the standard of the first four - but the episodic quality has fluctuated so frequently that it has started to become difficult to fully believe that Game of Thrones still has the potential to blow our minds. Enter "Battle of the Bastards". 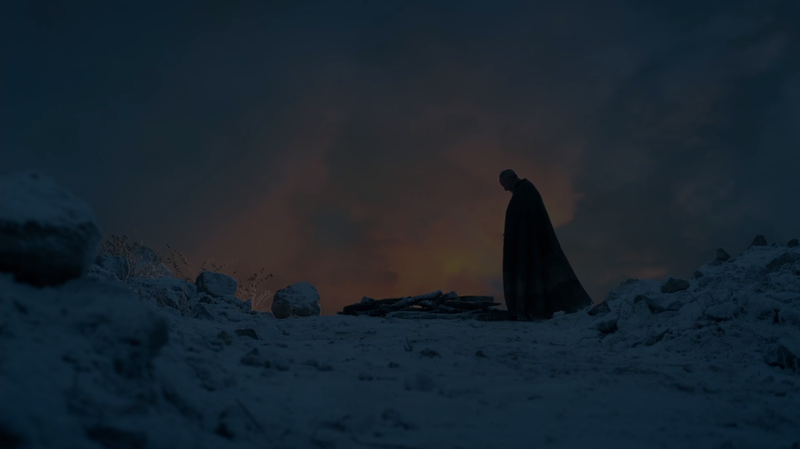 If there's one thing I took away from this episode besides a seriously shaken nervous system, it's the reaffirmed knowledge that Game of Thrones does indeed still have the potential to shake every bone in every viewer's body to the core. The episode begins with the Slavers' siege on Meereen, and the cinematic quality of the opening few shots really sets the visual tone for the following 59 minutes. The camera takes on the perspective of a flaming projectile and soars into a Meereen building, parts of the city explode and crumble with a kind of gritty realism that the show has often lacked since dragons and White Walkers became major threats. But then the tone shifts: the first line of the episode comes from Tyrion, and it's a joke. A funny one, at that. "Despite appearances, I think you'll find that the city is on the rise" he says unconvincingly as the sounds of explosions loom nearby. It's an immediate shift in tone, but sticks true to the characters the episode is currently focusing on. After this oddly humorous opening sequence, we cut to an exterior negotiation which is interrupted by the arrival of Drogon. Dany climbs aboard him, and he takes to the sky, reuniting with his brothers in flight before burning the central ship in the Slavers' fleet to a crisp. It's breathtakingly shot, superbly animated and utterly thrilling. But it's also triumphant. Triumph is a feeling so rarely felt in Game of Thrones, even more so in its infamous 'episode nines'. As thrillingly enjoyable as the sequence is, it's impossible not to shake the feeling that everything could go wrong at any minute. But it doesn't. "Battle of the Bastards" defies expectations by simply having Dany win with next to no downsides. She's gained a pretty big fleet, it seems as if the one remaining Master will listen to her plan now, and all of her dragons are free again. Things get even better when Theon and Yara arrive, offering her the support in Westeros that she so desperately needs, as well as yet more ships for her fleet. The episode then shifts its focus away from the battles and the drama to one throne room, and allows its characters to drive us forward. It's a pretty big risk considering what we've just seen (and what we know will follow in the North), but it pays off due to the complexity and richness of these characters. Tyrion's take down of Theon is earned, but it's simultaneously difficult not to feel sympathy for the latter after all he has endured. Yara's not-so-subtle flirting with Daenerys is funny, but the whole idea of these two women talking and planning their two futures together is legitimately interesting, and it seamlessly builds on the feminist theme that this season has been offering. I'll be honest, I wasn't expecting Meereen to appear in this episode at all, but I'm now immensely pleased that it did. It provided a nicely fluctuated tone, some well needed comic relief, and it gives the season finale considerably more breathing room. Game of Thrones frequently struggles with structure, but it nailed this episode perfectly. I use the term "film making" because that is what this was. When the two armies clash - in beautifully rendered slow motion that looks both stunning and horrifying equally whilst still keeping the central character foregrounded in the frame - it becomes difficult to accept that this is TV. The cinematography is so extravagant and engaging, the visual effects so authentic and real that it feels like you're looking at a $100 million film. What boosts this further, though, is the emotional weight behind every frame of this battle. Thousands of people clash swords, but we know from the word go who we want to die and who we want to survive. More than that, we know exactly why we want this outcome. The show has invested us into these characters so effectively over the last two seasons that even amongst a battle with this enormous scale, the personal and emotional stakes are as high as the dramatic ones. It would be very easy for the show to lose sight of its characters amid its flashy cinematography and gritty direction (helmed by the ever brilliant Miguel Sapochnik), and so it's a testament to Benioff and Weiss' scripting that this is never the case. Everything comes together in a terrifying and exhilarating manner. What also makes this episode so numbingly intense, though, is the number of individual set pieces taking place within the battle itself. We have Tormund taking on Smalljon Umber, a brief sequence but one that nonetheless put my heart in my mouth whenever it was on screen. 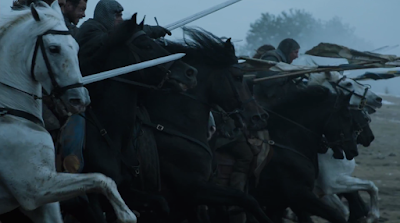 We have Davos heading in after the first charge, leading the remaining archers into battle in one final push. We have the Bolton army forming a Phalanx and trapping Jon's army between their spears and a wall of human bodies. Most horrifically, there is Jon trampled under the horde of fleeing Wildings, a sequence so claustrophobic that looking away feels like both a necessity and an impossibility. By the time he reaches the surface and gasps for breath its difficult not to join him. Finally, though, we have Jon taking on Ramsay in Winterfell, bludgeoning him to the ground before realising that it is Sansa who should have this kill. The episode's final sequence is one of the show's most gruesome moments to date, but it gave us what we wanted. The fact that it did so without ever sacrificing cinematic and emotional quality is what makes this episode such a phenomenal achievement for the show. "Battle of the Bastards" represents Game of Thrones at its very, very best: dark, gritty, thrilling, visually spectacular, emotionally weighted and unequivocally unique. It's been a rockier season than I'd have liked, but Game of Thrones is back on top form once again, and whenever the show reaches this standard of quality it becomes clear why it is one of the best shows currently on TV, and one of the most deservedly praised programmes of all time. This is for sure up there with the show's greatest episodes ever. 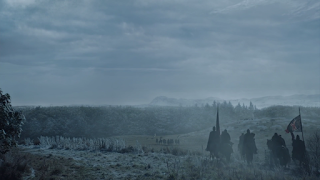 I think it just edged its way past Hardhome, but does it surpass Blackwater too? I'll need some time to think. 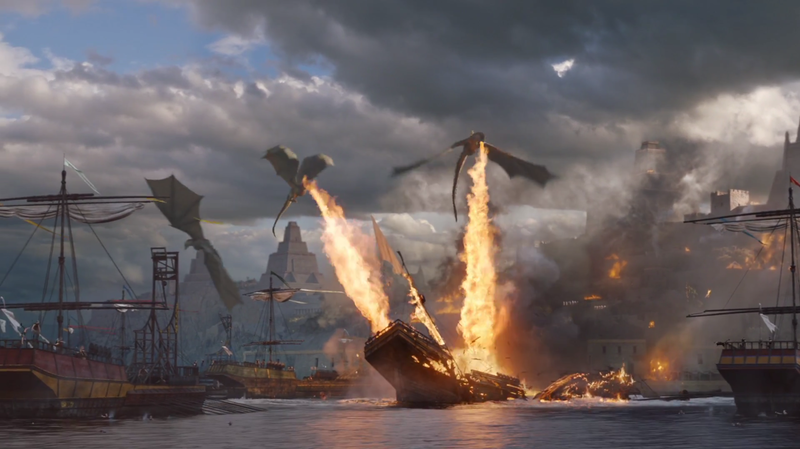 Seeing all three of Dany's dragons soaring over Meereen and setting that ship on fire was so exciting that I can't really find words for it. Daenerys got her field of fire and my inner fanboy flourished majorly, and I would like to thank Drogon, Rhaegal and Viserion for making this possible. Good job, guys! Gold stars all round! I have to admit to leaping out of my skin when Grey Worm sliced the throats of the two standing Slavers and spared the life of the kneeling one. I should've seen it coming, but boy did I not. Davos finding Shireen's stag model that he gave her was heartbreaking despite its implausibility. some things are just so touching and emotional that they transcend realism, and this fits that category perfectly. I seriously don't think I've ever seen anything to this scale on TV before. The visual effects and cinematography here were unparalleled. I mean seriously, the episode practically opened with a masterful sequence that most fantasy shows could barely pull off in their finale. Game of Thrones at its best is just a whole new ballgame. "You die tomorrow, Lord Bolton. Sleep well." I may have cried slightly when I heard the Vale's horn in the distance. From relief, mostly. Sansa's smile as she walks away from Ramsay while his throat is ripped out by his own savage dogs? The perfect icing on an already pretty damned perfect cake. Good luck topping that, finale!